Well, first of all – a huge thanks to Dani for mentioning my humble blog on her Facebook page. And welcome to my new followers! I hope that I can give you some pre-cooking tips for the divine recipes from “In The Mix”. I would love to hear from you, especially if you have any particular recipes you want me to try soon – or if you have any feedback on other stuff you want me to include in my rambles – or that you don’t want me to mention. 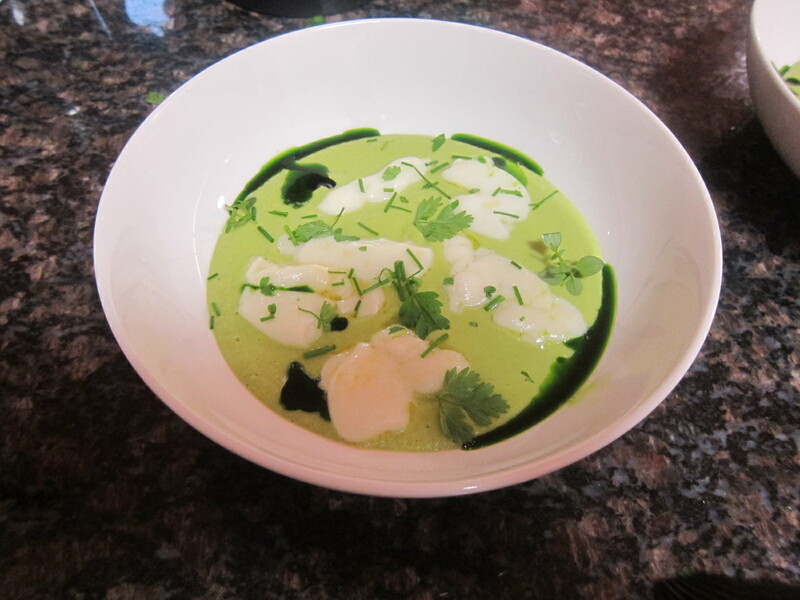 So, my project today was Kuzu Gnocchi with Pea Soup. (It was supposed to be yesterday’s project, but I had some trouble locating kuzu – even the local Japanese supermarket didn’t have it) Anyway, I tracked kuzu down at a Health Food shop locally – it’s the organic one and it was about $10 for 100 grams. It’s a weird looking stuff – white and chunky crunchy bits – so much so I wasn’t sure if I should sift it before I added it to the gruyere mix. I didn’t and it seems to have turned out ok… time will tell! For those who have the book, Dani has modified the recipe slightly since the first publication, and the new version will be in her third reprint. So I used the new version, which is on the In the Mix Facebook page. It’s actually a pretty easy sauce to make, the challenge comes with creating the gnocchi (and as some of you would know, I am piping challenged). This recipe is from Raymond Capaldi, who is the chef at Hare and Grace, Melbourne. First of all, I hadn’t eaten Gruyere cheese for ages. I’d forgotten how good it was, and I may just have cut of a little chunk or two for myself while I was making this. You can also make this with mozzarella, if you are so inclined. But Gruyere it was – and it was dead easy. Cut the cheese into smallish cubes (I managed about 15 or so cubes for the 60 grams) as it will make the initial noise of the cheese hitting the thermomix bowl lessen. If I had my time again, I’d have the kuzu pre-measured – so do that first before you start cooking anything – otherwise you’ll do what I did and end up with some kuzu sticking to the MC – unless you’re someone who inverts your MC all the time – which was a bit of a pain. I still haven’t got around to getting a decent piping bag, so I cheated and used the old zip lock bag, but this time I used a nozzle with it that I had from an icing set. Worked like a dream, although the mixture can be pretty hot on your hands – even if you let it cool down a little. When you’re piping the gnocchi, you need to do it in a bowl of iced water. I’m lucky as I have an ice water dispenser in the fridge, but make sure you have this ready to go – and my suggestion would be to have the water in a large, shallow dish so you can get lots of gnocchi in the one dish, without having to crowd them together. Mine are in two bowls – one with high sides, which made life difficult for the piping, and one large flat bottomed soup bowl, which actually worked quite well. I started off having some ice cubes in the water, but ended up taking them out as they caused more trouble than they were worth. You could probably use a lamington tray if you were going to use the gnocchi immediately, but if you’re planning of keeping them in the fridge in water for a few days then use something you can easily seal. I have two bowls taking up lots of space in the fridge, as I was too scared to try and move them all into one different bowl…they just look a little too frail. Might attempt it before I cook them tonight and see how I go. The pea soup component is so easy – and taste delicious if the spoonfuls I’ve had while cooking it are anything to go by. It has lemon zest in it, which really adds a lovely tang to it. I’m hoping that Master 3 might even dare to try some – he used to love peas and has gone completely off them of late. And there’s nothing like the taste of fresh peas – makes you wonder why we ever bother with the frozen kind! I also took Dani’s suggestion and made the parsley oil to go with this, which I’ll blog separately. It looks, smells and tastes absolutely beautiful! So, I’ve just eaten it – absolutely delicious. The pea soup is lovely and thick and is a lovely shade of mid green. I think in retrospect I should have piped the gnocchi a little larger, but the good news is that once they are chilled well in the ice water they are a little more amenable to moving! I made mine about 1.30 and cooked them at 7, and stored them in the fridge in water in between. They firmed up quite nicely, but they are slippery little suckers, so be careful when you’re using the slotted spoon to get them out of the bowl of iced water. Be sparing with the olive oil when you heat them through before you serve the gnocchi component – they melt pretty quickly – I guess they wouldn’t if they were larger – so use a large frying pan and spread them out so they don’t melt together. Mine lost their shape a lot, but it also could have been that all the kuzu didn’t make it into the mixture, and I was a bit nervous about adding some extra in as I wasn’t familiar with using it. I was a little lazy and served this in a large bowl rather than a plate, and if presentation is important to you, I’d definitely use a plate in future as I think it makes the dish look far more impressive. We were being naughty and eating on the couch, so I didn’t want to risk the whole lot going west – so bowls it was. Definitely use the parsley oil if you can – it looks and tastes beautiful. If I had served it on a plate, I could have spread it artistically around the pea soup, but I just put in a few splodges and although it didn’t look pretty, it tasted great! So – the family review was positive – we’ll definitely have these again! We had this as a dinner rather than an entree and it was quite enough for 2 adults with healthy appetites and a small serve left over for Master 3 tomorrow!